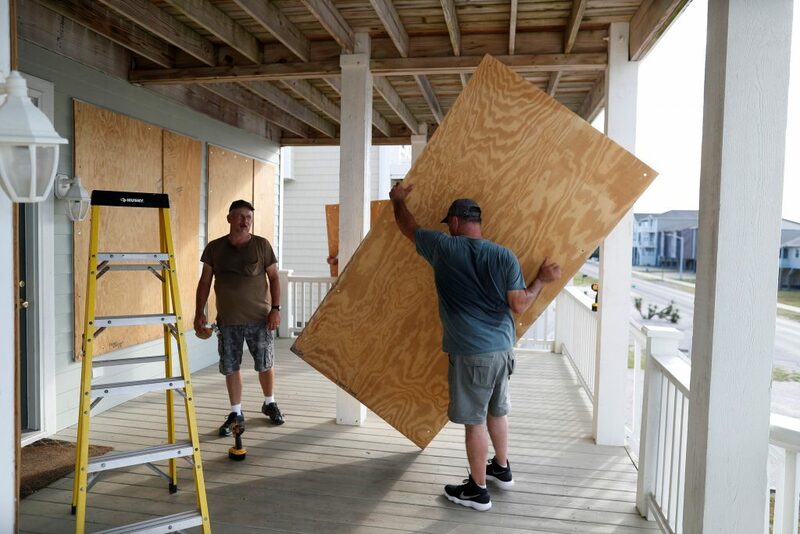 As weather experts raised high levels of alarm at the havoc Hurricane Florence could wreak on several southern states, Jewish communities in the storm’s path were keeping themselves abreast of changing conditions as many debate when and whether to heed calls for evacuations. More than one million people have cleared out of coastal areas in the Carolinas and Virginia, but on Wednesday, many were still biding their time to see if the next day’s forecasts would bring a lifting of evacuation orders. By Tuesday, the second day of Rosh Hashanah, South Carolina’s Governor Henry McMaster had issued an evacuation order for areas close to the ocean. Yet, with the storm not predicted to strike until Friday or Shabbos, Rabbi Michael Davies of Congregation Dor Tikva of Charleston, South Carolina, said that he and many others to whom he had spoken were carefully monitoring what the coming hours would bring as far as weather conditions. “We’re waiting to see what the predictions will be tonight or tomorrow before we decide what to do,” he told Hamodia. Rabbi Davies echoed a theme voiced by many in the storm’s possible path — that he was overwhelmed and grateful for the many invitations and offers of help he had received from nearby Jewish communities. “Within 12 hours after Yom Tov, I had offers from six or seven other Rabbis that my congregation and I are welcome,” he said. Last year, when Hurricane Irma hit Florida, hundreds of residents from Miami and other Jewish communities in the state escaped to Atlanta, where Congregation Beth Jacob had coordinated a massive hospitality effort. In addition to uncertainty over the strength of Hurricane Florence when it makes landfall, Rabbi Davies said that questions over the storm’s path had made some hesitant to evacuate. “It could come straight for us or hit North Carolina and not us and it could hit Georgia also, so even if we decide to leave, we aren’t sure where to go,” he said. Perhaps most telling as to the harried situation in Charleston, Rabbi Moshe Davis, who leads the Brith Shalom Beth Israel Synagogue, was too overwhelmed in dealing with storm preparations to speak at length. Charleston resident Charles Steinert on Wednesday afternoon was packing his suitcases, but he and his wife had not yet decided whether to take up an invitation from a friend in Jacksonville, some four hours south. Further north in Norfolk, Virginia, evacuation orders had been ordered for some areas of the coastal city over Rosh Hashanah; however, on Wednesday, as predictions looked more favorable for the area, most residents were cautiously staying put. “Right now the biggest concern is flooding, since it sounds like we will be spared these gale-force winds, but we are in a low-lying area and people are looking to put their cars in safe places,” Jeffrey Brooke, president of Congregation Bnei Israel in Norfolk, told Hamodia. He added that many people had been slow to heed evacuation orders initially, as these have become increasingly more common in recent years. Bnei Israel’s Rav, Rabbi Alexander Haber, said that when word began to spread on the second night of Rosh Hashanah of evacuation orders being issued, he got a steady stream of knocks on his door from concerned congregants. Unsure of how to advise them, he walked to the local police station, where officers confirmed to him that there were no plans to evacuate the area the coming day.